Archived 4th of March 2018 from Publiclab.org. Header photo credit: Matthew Coolidge. I’ve been flying solar hot air balloons since 2008 and thought I’d summarize some of my experiences here, since most of my work on them were before the PLOTS site. Here’s my summary post to the grassroots mapping list back in October, 2010. 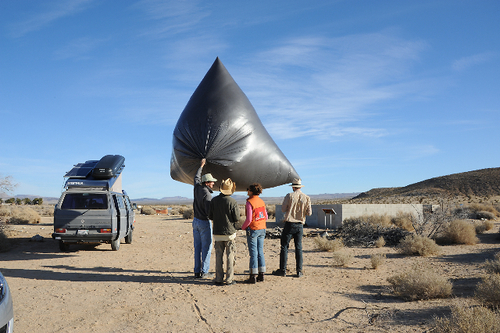 Also attached is an annotated version of my solar balloon taping guide from 2009, with some good illustrations. Solar hot air balloons are beautiful, fun, and really cheap (less than $5), but extremely wind sensitive and too big to fly legally above 300 feet (95 meters). They work great in deserts, tundra, and any place with lots of sun and without trees, buildings, wires, or many people. Flying them on a line does not give one much control, and they will blow over to near horizontal in any amount of wind. 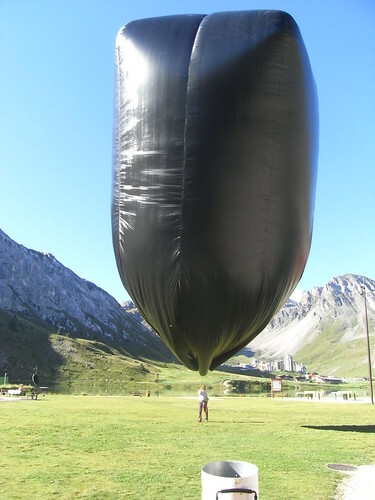 a 12’ (4 meter) balloon gets about 1kg spare lift. That’s a lot of surface area with very little lift to keep it in place. I find 9-11AM, when the wind is usually calm but the sun pretty intense, to be the best time to fly. in order to get imagery, I look at the wind direction and pretty much let the balloon free float down wind over whatever I want to take pictures of. I then pull the balloon down, walk it up wind, and repeat. In my attached guide, I discuss a quick deflation strategy that can be useful for free flying hot air balloons in more crowded areas. I’ve had mixed success using this strategy with balloons big enough to hold cameras. The Praturlons use really thin .3-.4 mil black HDPE. I can’t find that material regularly (some cheap garbage bags are made of that) and so I use .3 mil translucent HDPE drop cloth powder coated with pigment, following the recommendations of Robert Rochte. 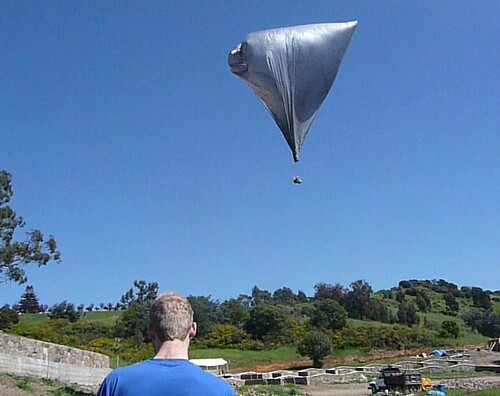 Robert was active on the now largely silent Yahoo Solar Balloons Group. The transparent film is definitely stronger and more durable, so I really prefer it. I only make tetrahedron balloons (triangular pyramid), because they’re really quick to tape up. I can make a 12 foot one by heat seaming in about 30-45 minutes or with tape in about an hour and a half. I generally make tetrahedron by folding from a rectangle with a ratio of sides 1 to the square root of 3, which is the ratio to make a platonic tetrahedron. I have calculated the volume of my balloon using Steve Griffin’s guidelines. He also has a great hot air balloon lift calculator. As mentioned earlier, I use thin (.3 mil) HDPE “painters plastic,” a 12 foot wide, 400 foot long roll costs about $25. I coat the inside with pigment, specifically Bayferrox iron oxide black 330. Bayferrox’s distributor LanXESS is a very nice company that has mailed me several 1lb free samples over the years; I don’t think they sell a bag less than 50lbs. This pigment was discovered in a group of samples Molly Danielsson brought me from the concrete factory where she works, and I’m very satisfied with it. James Lent and I have tried a range of pigments and this is the only really dark one.. Call LanXESS’ Inorganic Pigments department, and be honest about what you’re up to! this can be done just as well with a regular clothes iron – no steam. I find it easiest to run the iron on its edge. A flat surface underneath is a must, and a long metal ruler works best. The hot iron melts the plastic towards the cool metal ruler, where it forms a nice bead. I’ve annotated my old guide (2009) to folding and taping to correct info (attached below). If you want to tape a balloon, follow these instructions and save yourself the headache of figuring out how to line up the seams. I clip open a corner of the balloon wide enough to inflate with a computer fan, and pour about half a cup of pigment into the balloon. Then, without inflating it and with the cut corner held closed, I work the pigment down and around, rubbing it all over the inside. I then pour out the excess. No matter what, you’ll get a little dirty. I make an inflation device that consists of a computer fan attached to two nine volt batteries in series. The fan I wrap with some cardboard to make a tube, and stick the tube into my balloon. It inflates in about 10 minutes, and heats up rapidly in the sun. 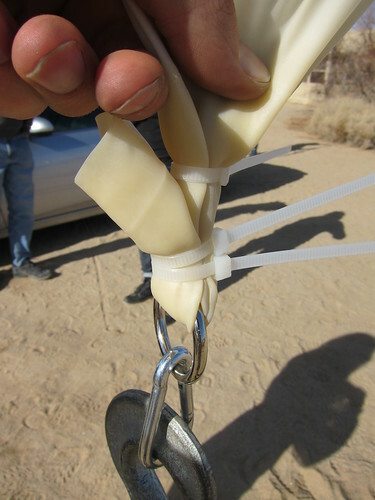 Just use the same system of a ring and zip-ties Aurora Tang taught us to use to close helium balloons. it works great and is totally easy.